Breakfast, Lunch, or Dinner is served! Sizzling hotcakes, scrambled eggs, bacon,….. hot dogs and juicy hamburgers grilled to perfection….. or sizzling steaks or chicken and dutch oven potatoes…. and of course all the fixings. No matter the meal, we have a cookout for you! The delicious food is only part of it. 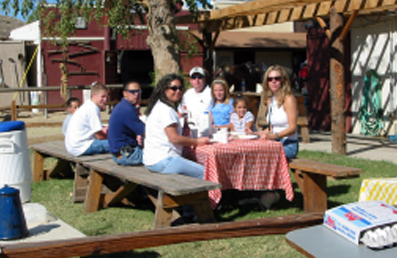 We also provide a 1 hour horseback ride or wagon ride (included) through the beautiful South Mountain Park before enjoying a cookout in a private setting on our property OR enclosed in the nearby box canyon. 25% deposit required. Please keep us informed of changes to group numbers so that we may adjust the amount of food accordingly. Cancellation notice for a deposit refund is 48 hours. Call for more information. 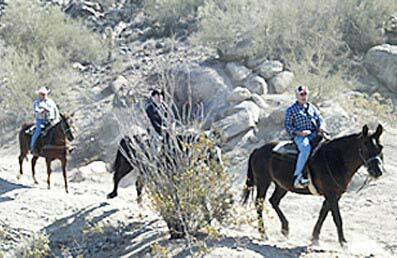 For groups 25 or larger, we offer both horseback riding and wagon rides. Sorry, smaller groups must either choose horseback riding OR wagon ride. The desert’s beauty is magnificent as the sun rises. A peaceful horseback or wagon ride is the right way to start the day. Upon return, the irresistible aroma of of fresh cowboy coffee will overwhelm you as you ride up to the cookout site. 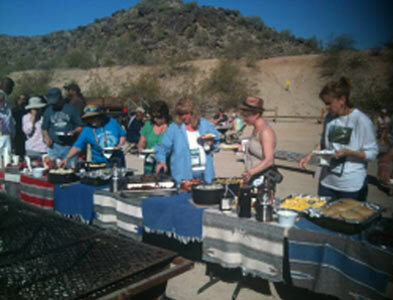 Breakfast becomes a special treat for your group when it’s served cowboy style with a menu consisting of pancakes, scrambled eggs, bacon, orange juice, water, coffee, and hot chocolate (in winter). We can substitute Egg-Beaters, or turkey bacon with advance request. RATE: $47.00 per person, minimum of 8 people, ride is included, BUT please call for special arrangements. America’s favorite cookout food served in the great outdoors is perfect for birthdays, reunions, office get-togethers, or any other special event. Enjoy all-you-can-eat 1/4 burgers and all beef hot dogs with all the fixings accompanied by chips, cowboy beans, lemonade water, coffee and hot chocolate (in winter). Vegetarian burgers available by request. RATE: $52.00 per person, minimum of 8 people, ride is included, BUT please call for special arrangements. There’s no better way to end the day than with an evening ride followed by a mesquite grilled1/4 chicken or 12oz t-bone steak! 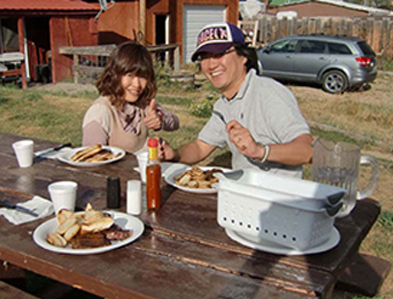 You have your choice of 1/4 chicken white or dark meat OR 12oz t-bone steak, along with dutch oven potatoes (cooked in a dutch oven,and loads of butter), cowboy beans, garlic bread, lemonade, water, coffee, and hot chocolate (in winter). Vegetarian burgers available upon request. RATE: $64.00 per person, minimum of 8 people, ride is included, BUT please call for special arrangements. Our prices include taxes, but do not include gratuities for your cooks and wranglers. We do appreciate your consideration. If you have a good time, please think of them.